This document can be used by those selling goods or services online to create a cancellation form for consumers as required by the Consumer Contracts (Information, Cancellation and Additional Charges) Regulations 2013. The text of this document comes from Schedule 3, part B of those Regulations. Section 13(1) (b) of those Regulations states: "Before the consumer is bound by a distance contract, the trader .... if a right to cancel exists, must give or make available to the consumer a cancellation form as set out in part B of Schedule 3." This notice template is primarily intended for use by businesses to create forms which can then be incorporated into, or made available via, their websites. A small amount of editing will need to be done by the business before the form is ready for use. 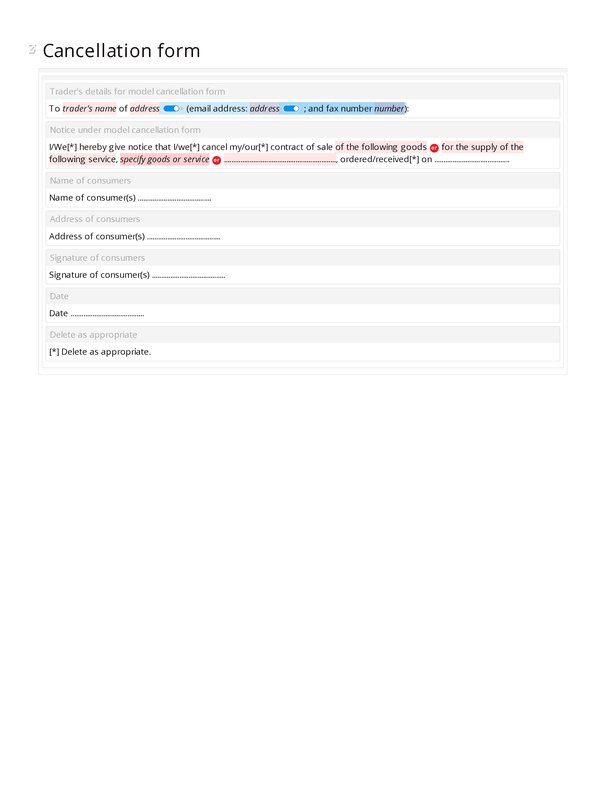 Trader's details for model cancellation form; notice under model cancellation form; name of consumers; address of consumers; signature of consumers; date; delete as appropriate.